Nokia has launched N96- its converged device in India. It will be available across the country from September 2008. Nokia has also announced a pre-booking scheme, offering consumers the opportunity to secure the N96 in advance. The offer will be valid through 2000 Nokia outlets across the country starting August 20, 2008. The dual-slide Nokia N96 is a blend of style and cutting edge technology.Optimized for web access and entertainment it represents a whole new chapter in mobile technology. A memory size of 16GB expandable to 24 GB through an external micro SD card, which allows users to store up to 18000 songs, up to 20000 images at 5 mega pixel, up to 60 hours of video or 20 full length movies.With multifunctional media keys and a 2.8” screen, music, movies, games and more are available at the touch of a button. To make playing, watching, listening or experiencing the content even more enjoyable, it features a ‘kickstand’ on the back cover that allows for hands-free viewing. It is the first ever mobile device to come preloaded with Wave Secure, a S60 unique security application that allows consumers not just to track their handset in the event of loss or theft, but also create a backup for the phone data via the Internet.Additionally, in the event that it is lost or stolen, WaveSecure helps remotely wipe out all data from the device to prevent misuse, lock the device remotely and even track any new sim card inserted. This is an application being offered exclusively to consumers in India. Users can also explore the world through Navigation and the Nokia Maps 2.0 application. The new Nokia Maps application offers richer and more detailed maps and has upgrade options such as City Guides, turn-by-turn pedestrian mode and voice-guided car navigation. Further, with the integrated A-GPS, consumers can now ‘location tag’ their pictures with location data and share them with their online communities. 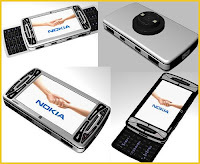 A high-speed USB 2.0 connection and WLAN and HSDPA support, which enables the users to find, create, transfer multimedia files and share them on their social network.The Nokia N96 supports the OVi family of Nokia internet services, including maps, music, media sharing and more. A 5 megapixel camera with Carl Zeiss optics, a dual LED flash and video light which allows DVD-like quality video capture at 30 frames per second.One can also find, play and queue favourite tracks on the go with the most advanced music player. It features media keys, a 3.5 mm headphone connector and built-in 3D stereo speakers which gives the users a superb music experience. The N96 also enables game enthusiasts to compete with friends from the palm of their hands. Users can enter the N-gage arena and challenge the world to a wide array of games or even blog about their favourite games and chat online with other gamers.